There are a few different reasons why bees will fan their wings. They may be regulating temperature and humidity in the hive. On hot days you will see bees at the front entrance moving air through the hive and cooling things down. The hive in the video above had two full supers of nectar, the extra airflow from the fanning helps reduce the moisture content of the nectar and cure it into honey. Bees stick their butts in the air and bend the last segment of their abdomen down to expose the gland. Here's a video of the same hive as in the photo above. 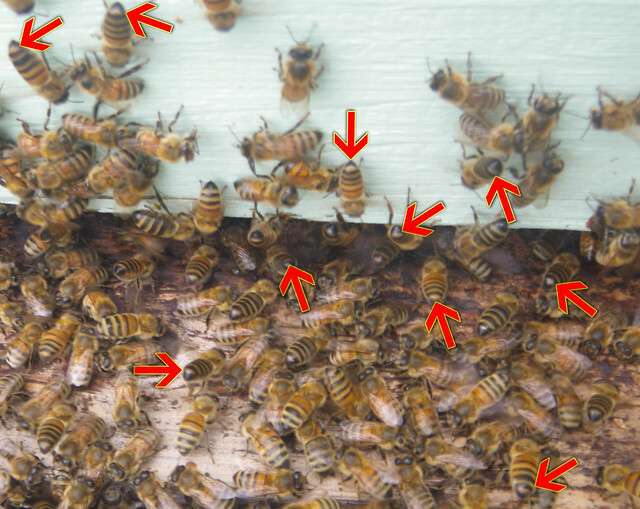 See how many bees you can spot sending out the pheromone. In this case the fanning bees are calling back a large group of bees that had been shaken out of the hive during an inspection. Similar behaviour occurs at a hive entrance when a swarm first reaches a new home, after orientation flights, or when a queen departs on a mating flight. A few more details about the nasonov gland can be found here.